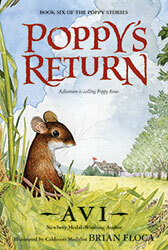 Poppy returns … with big trouble. Family trouble. Poppy and Rye don't know what to do about their son Ragweed Junior's attitude. He is rude, he is crude, and he has dyed his fur to look like Mephitis, his skunk friend. In short, Ragweed Junior is very much a teenager. Even Ereth, the cantankerous porcupine, with his salty swearing, can't straighten him out. Then Poppy gets an urgent request to return to her old home, Gray House, where her aging parents, Sweet Cicely and Lungwort, are in difficulties. Not only does she agree to go back, she decides to take Junior, in hopes traveling together will bring them together. But when Junior's skunk pal and Ereth join the party, the trip doesn't quite go as expected. And when Poppy recalls she did not get along with her parents, things become even more complicated.